Glass production involves three main operations as parts of manufacturing process. 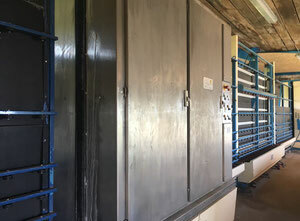 First operation is the batch house where the raw materials are stored and handled. Second stage is the hot end - this is where actual manufacturing takes place. 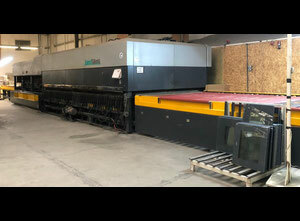 During the hot end phase, glass is heated and melted in the annealing ovens and then formed to shape the final product. The last stage - cold end - is responsible for final product inspection and packaging of the glass items. 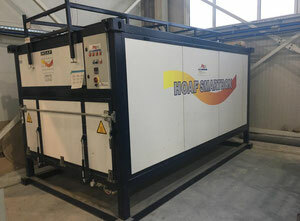 Glass working machines can naturally be involved in the hot end, manufacturing phase. The initial phase of the glass-making process is called batch processing. Raw materials are stored in batch houses in large piles. Commonly, batch houses can hold 1-5 days of raw material and some systems are even able to process raw materials. Initially, raw material processing includes screening, drying or pre-heating. Batch houses can be manual or automated. Glass raw material is measured within the batch house, furthermore glass is mixed and delivered directly to the furnace for further processing. Batch making is generally affected by different types of glass, it's quality, purity and color. After the batch is fed into the furnace, glass is processed to allow further forming. Glass forming methods include blow & blow technique which is used for glass containers with narrow neck and press & blow method mainly used for jars. Blow & blow method. Glass is blown through a valve in the baffle and is forced down into the mould to shape the final form. Glass containers are produced in 2 stages. The body of the glass container is originally way smaller than the final size. Such semi-ready jars are called parisons, they can be blow-molded into the final form rather promptly. Press & blow method. In the press & blow technique, a metal plunger is used to form the glass. The plunger rises up and presses the glass to shape the mould into the final product. While the glass is still soft, it's cooled down by the air flow. 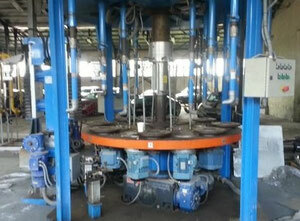 The forming machines hold and move the parts that form the container. 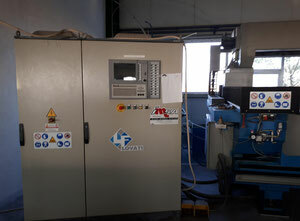 The machine consist of basic 19 mechanisms in operation to form a bottle and generally powered by compressed air (high pressure - 3.2 bar and low pressure - 2.8 bar), the mechanisms are electronically timed to coordinate all movements of the mechanisms. 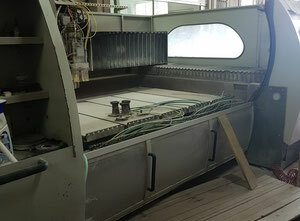 The most common arrangement of the glass forming machine is the type called individual section machine (IS machine for short). 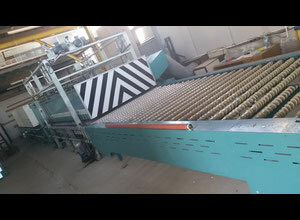 Individual section glass machine has an in-built bank of up to 20 identical sections. Each of the sections (usually from 5 to 20 sections) contains a mechanism to produce glass containers. All sections are aligned in a row, while a moving chute (gob distributor) feeds the gobs into each section. 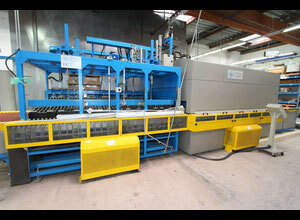 Sections are capable of producing one, two, three or even four glass containers at a time. According to that, the gob would be called single, double, triple or quad. Following the demand for eco-friendly green packaging, glass jars and containers are exactly providing the very much needed alternative for plastic. Glass working machines are widely used in food and beverage sector, where they come in line right after the food processing machines. Jam jars, chocolate spread containers, soda, beer and wine bottles - all these variations of packaging are strictly made of glass. Coca-cola famous bottle has already become iconic, and yes, it's also manufactured on a glass forming machine. 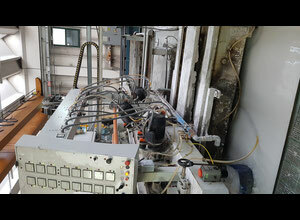 Glass working machines also find application within medical sector since they are used for production of ampules / vials. 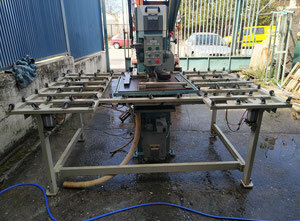 MM30 model is one of the most famous ones among glass working machine. The Moderne Mecanique ampoule machines have 30 work stations to ensure high-speed production. 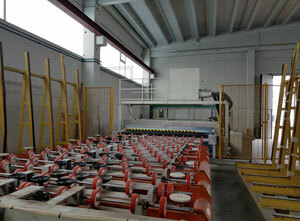 Other leading manufacturers for glass machines are Lovati Fratelli, GTM, Bottero, Busetti and more. You will find the most popular and well known names in Exapro online catalog.